The goal is to get a good bead on what you’re really getting from a bunch of machines that, other than tank size, look quite similar to one another. All of them are quite different and make up a wide spread over the operable range of small portable shop/site compressors — which was really the point. So we began the comparison/test on the basis of specs, portability, performance, noise, features, price, and ease of maintenance. 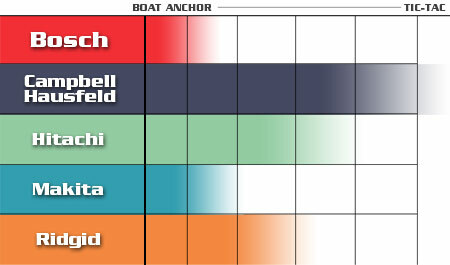 To make stats simple to compare, we put together a small chart with the size of the tank in gallons, horsepower, cut-in and cut-out pressures of the the motor, and the all-important Cubic Feet per Minute of air rating for each (with the exception of the CH, which didn’t list that information — read: Low). Now that we have that out of the way, you might ask what the hell that means; we know we did. 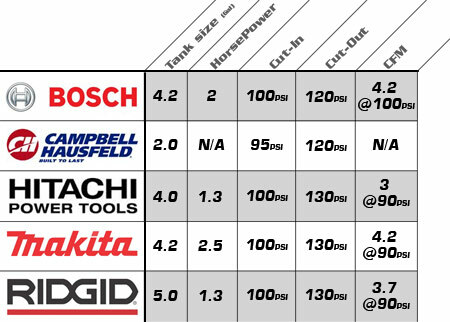 Based solely from the chart data we can say the Bosch and Makita lead the way with both the most horsepower and CFM, with the CH and Hitachi rounding out the other end of the spectrum. This should come as no surprise, as anybody with a few hard-earned dollars to spend on compressors could look at the spec sheet at the big box and tell you the same thing. So we pressed on. Our compressor lives in the middle of the action under the miter saw, and doesn’t move unless we haul it out for maintenance. However, this is not so at every shop or job site. So we decided to carry each a distance of 150’ to find out how much each one would tear us up. We tested each one on a different day to minimize any fatigue issues from carrying a competitor. As you can plainly see from this colorful yet completely scientific chart, by measures of magnitude the clear winner was the CH — also not surprising. The clear loser did surprise us a little, however. Though it’s the penultimate by way of curb weight at 72 lbs. to the Makita’s 77 lbs., the Bosch just kept banging into our legs and making life hard to deal with. To be fair there is a Bosch version of this compressor with wheels, so if you had your heart set on the Bosch and wanted to constantly move it you could do so without rupturing something — but that did nothing to ease the bruise on my thigh. To test performance, the only way we could figure to make real performance tests was to run each unit as our shop compressor for a few weeks and see how it went. In part II of our compressor test, we’ll show you how each unit did in actual performance testing, and which ones left us with bones to pick. I want to know dB rating. I need a 5CFM compressor at 90 psi thats semi quiet. The beast I have now is just way too loud. I hope to hear what the duty cycle is on each of these compressors. If we are talking portables, I see a lot of those red Porter-Cable pancakes on job sites, followed by a mix of Dewalts, even less common on the job sites that I come across would be Campbell Hausfields and Craftsman. Rarely do I come across any Makitas, Hitachis, Rolairs, Thomas or Rigids. I have seen a couple of those little 1 gallon Senco hot dogs around as well. I’m with karst about wanting to know db levels. Rather than believe the specifications, I’d be interested in seeing your own db measurements just in case each mfg has a different way of specifying noise. ya i would also like to know the db. my dad still rocks a rolair from before this site was probably made and the thing is loud as hell. woud love to get him a new one…. or maybe me a new one…. i mean him…. If it has wheels and a hitch it’s kinda’ portable, right? I bought a 5Gal “Superior” brand Chinese knock-off that looks identical to the Hitachi. For $185 it came with a dual tank compressor, 50ft of hose and a clipped head framing gun. That was 8 years ago now and I haven’t regretted a penny. I’ve framed out a new garage, done major reno’s, a gazillion bird houses, and picture frames, etc. I have bought good Porter cable nail guns since then for finishing, and a paint sprayer. It is loud, but who cares, so is my chopsaw, tablesaw, router, and my ShopVac (although those tool don’t habitually autostart). I permanently mounted it to a cheap old dolly to make it easy to move. db levels to come in the next post during testing and performance. Thanks for the promised db levels. I’ve been looking at the GMC Syclone because of the really low noise levels compared to most small compressors, but their CFM output and maximum PSI capability are marginal. Depending on your situation if you’re concerned about noise I’d check out the Ridgid Tri stack. Even if the motor is pretty loud you can stick it someplace where it doesn’t matter and run your tools off the tank and get consistent pressure. I haven’t used it but I like the idea and would likely pick this up if I was in the market for a compressor right now. FYI: 5 years is a short lifespan for an air compressor. I have a Hitachi that looks identical to the one in the picture and I use it just about every day in professional use. It can pump enough air for two framing guns easily (actually I thought it produced more than just 3cfm@90psi). I have never changed the oil or treated it particularly nice but it has pumped my air for about 12 years now. I don’t foresee needing a replacement for some time to come. A couple of things about that compressor: First, it was always awkward for me to carry so I cut the handle off and rotated it about 30 degrees – securing it with a pipe inside the pipe handle and a couple of clevis pins. It is much easier to carry now. Second, It was made in Italy! That’s one reason I bought it. I don’t really trust Hitachi tools since they are mostly made in China but the specs on that compressor were compelling and the made in Italy tag put it over the edge. I don’t even know if being Italian made is a good thing – but must be better than China. 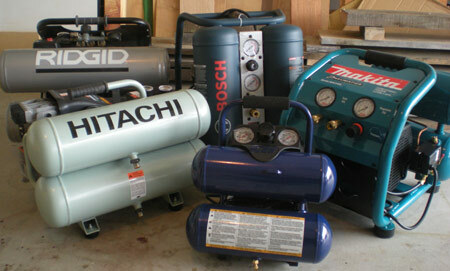 All that said, I did recently add another air compressor to my arsenal – A Senco 1hp/1gal that is suuuuuuper quiet. It can be sitting right next to you but sounds like it’s off in another room. I like it a lot. A hunch tells me it’s not made in Italy anymore either. @DC – That super quiet Senco of yours, is that the PC1010? We’ve been using Emglo’s for many years with good result on jobsites where a portable (versus a transportable – e.g Atlas Copco) will do the job. We have both AC and engine driven ones. Since Emglo was bought out and is now part of Stanley – B&D – I might be inclined to try a Dewalt too (maybe the Emglo know-how has been transferred). When I need to drive air tools, I use CO2. A 20lb cylinder is lighter than a compressor. Doesn’t need electricity or gasoline. It’s completely quiet and will drive an air nailer or two all day long. Heck it’ll drive my 1/2 impact wrench all day long. Cylinder depots run about $200 and the regulator runs $150, after that it’s $16.95 to trade out the cylinder. I’ve been looking at those CO2 setups but I want to be able to refill my own tanks because I’m not paying $17 each time.. Anyone know what the cheapest option is for refilling a CO2 tank at home? If you want quiet rotary is the way to go, if you want kinda quiet and also affordable most belt driven compressors do ok.
Re: CO2 tanks: SO glad you asked! How about this; go to a paintball store for a refill! Cost=$4 plus tax! Like you, I was certain that $35 (at Lowes) for a cylinder was unworkable. Luckily, a paintball store in the area will refill for Four bucks! I bought another cylinder (cheaper from the paintball store too.) Now tanking up will be 8 bucks and not too frequently. I think it is workable! Incidentally, I am in southern California, if that matters. My opinion, it’s great for light to medium use. All of these reviews should include the comparable harbor freight equivalent product for those of us who are cheapskates at heart.